We all dream of making a difference in the world. There are people out there who are doing so everyday. When a friend of yours quietly and humbly just gets on with it and you just happen across a body of writing that brings it to light, you cannot help but be affected. 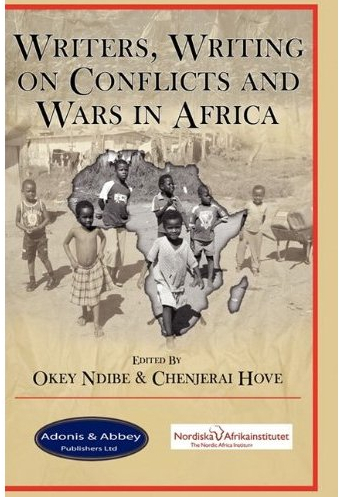 The book Writers, Writing on Conflicts and Wars in Africa edited by Okey Ndibe and Chenjerai Hove is a collection of essays written by real people doing real work within Africa. My friend Mike Woodman is one of those who contributed. I have asked Mike permission to include an extract of his essay here on my blog. This is followed by a brief bio of Mike. BOOM, BOOM, BOOM, BOOM; gunfire shatters the stillness of the night. I roll onto the floor instinctively, staring upwards in the direction of the bullets hissing above the thatch roof. My heart pounds with raw fear and I try to reassure myself that any bullet would have to pass through two mud brick walls to reach me. I assume the heavy calibre fire is spewing from the truck mounted antiaircraft gun at the nearby military camp. It intensifies and is now answered by the crackle of smaller calibre fire spattering from one direction then another. An engine screams and revs in low gear. Footsteps; urgent shouting; then voices are outside my hut. The door swings open but from the floor I can’t identify the robed silhouette. “I am Mohammed,” comes the familiar but breathless voice of our guard. I dress hurriedly. A wounded man is being carried into the compound followed by a crowd of men and a few women. I direct them to the tent and ask for the generator to be started. The man is in agony. He hangs around the necks of two men who are supporting his legs. His white trousers are ripped and wrapped tightly and knotted around his right knee as an improvised bandage which is dark and glistening. His name is Farid and he is the younger brother of the local chief. He is laid on the table in the makeshift operating theatre, a canvas tent. I open the bandage. Several bullets have ripped through the knee leaving shards of gleaming bone amidst a mangle of flesh. I quickly cover the wound and lean hard down on it to stem the bleeding. The midwife sets up the drip and injects the general anaesthetic whilst I finish donning a surgical gown and scrubbing my hands. I start to work, stopping occasionally to swipe in vain at the gathering swarm of flies. We finally leave the operating tent as dawn breaks and I strip out of the bloodied surgical gown. Farid is waking but woozy under the cocktail of anaesthetic and painkiller. He will not lose his leg but will never walk normally again. Sleep won’t come; my eyes dart restlessly in the darkness behind my closed lids. Eventually I drift into a fitful sleep punctuated by vivid dreams: I am kidnapped by rebels at gunpoint, taken by horse to their cave and operate on their wounded colleagues in a cave by candlelight. Mike Woodman was raised and educated in Zimbabwe. With a medical degree from the University of Cape Town, he completed his internship in the UK and Zimbabwe. He left his post at a government hospital in Bulawayo to work with Aboriginal communities in northern Australia. Following a longstanding ambition, and finally equipped with enough experience, he volunteered with the French aid agency Medecins Sans Frontieres. Since then he has lived and worked in Sri Lanka, Afghanistan, Indonesia, the Democratic Republic of Congo, Sudan, Vietnam and Russia. Along the way, he obtained further qualifications in international public health in Australia and tropical medicine in London. His passion is the provision of acceptable level medical services to those most in need in this world of recurrent conflicts, natural disasters and ever increasing inequalities. He is currently based in Harare with his partner Tanya.